THANK YOU ERIC!!! God bless you! I am 15 and have found similar information. Thank you for presenting this to the public at best you can. And to skeptics of this website, if you research, I mean ALOT of research, ALL his claims you'll find they are backed up with good information that is not well representation in the mainstream media. Some of these things were talked about and backed up with information for decades, if not hundreds of years. The story fits, if all the pieces fall into place. I don't know about the mars missions and the moon landings though. I must research more on that subject at another time. And since the 1940s the U.S. government or the federal resserve was talking about using planes as weapons against enemies. 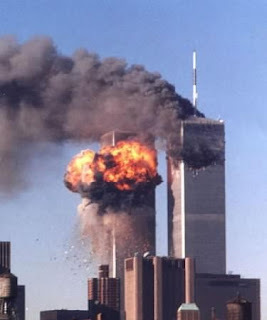 Chaneey was in controll of all flights that day and there was never any rsponse as to why they didn't send out other jets to stop the one that hit the world trade center when one had already hit the pentagon. I actually seen one fly (very slowly, low, and as if it would fall) over Brooklyn over when I was 9 and walking to school that day. There is alot of unanswered questions about this. 1. Structural steel is significantly weakened by temperatures well below the actual melting point of the material. It will lose its strength and, just as importantly, become significantly more ductile. One of the theories of the WTC collapse (I forget if it's the "dominant" one) is that the steel beams sagged, pulling in on the exterior columns and causing them to buckle. Typically, the strength of a column is controlled by buckling - a slender column has a certain unbraced length which is the distance between stiff bracing elements. If the beams lose thier stiffness, as happens when they are heated and sag, the unbraced length is significantly increased and the column will buckle and fail. The same behavior will be exhibited in the other main collapse theory, which, if I recall correctly, was that the connections between the beams and the columns failed. 2. 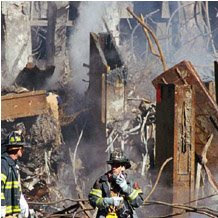 The WTC, in addition to fires, suffered significant damage from the initial collision, resulting in immediate failure of several load-bearing columns. As far as I know, this is the only incident of a plane of this size crashing into a skyscraper. Correct me if I'm wrong. 3. No building is ever specifically designed for a collision of this nature. I believe the engineer of record stated that he had "considered" the possibility, but I'm pretty sure he said it was an errant personal plane, and there was never any evidence of a detailed analysis (I'd be interested in any reference you may have had for your statement, actually). Even if he had wanted to, the amount of analysis and overdesign that would be required to make our buildings collision-proof would increase the cost of construction exponentially. It is quite simply infeasible to design buildings to such a standard, especially since this is such a staggeringly rare occurrence. To give you a rough idea of what this would entail, consider that a plane of this size could easily take out, say, 3 columns in a row in the initial impact alone. To redistribute the loads, the floorbeams must have a carrying capacity 9 times higher than they would previously have needed (beam design is typically controlled by moment, which is a function of (span length)^2). This is neglecting any adverse effects on the beams due to intial collision or subsequent fires. None of this disproves the idea that it was actually a controlled demolition, but implying that it's laughable that the buildings could have collapsed on their own is not correct at all. The Madrid Windsor Tower steel framed building burned for 20 hours, decimating it entirely, but it did not collapse. WTC 1, 2, and 7 (if you believe the pathetic official story) were the first steel framed buildings in history to collapse due to fire. Building 7 wasn't hit by a plane, only had fires on 2 floors, and imploded symmetrically into it's own footprint at the speed of gravity. 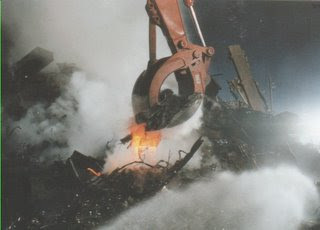 Demolitions experts and over a thousand architects and engineers at ae911truth.org have all put their careers and credibility on the line to say that these buildings did not fall from fire/debris/planes. Even the 15 year-old commenter above you can figure this out, but you Ben, are still re-hashing the same trash the government told you on day 1. I understand you get your shits and giggles from being "skeptical" about everything I write on this blog Ben, but why don't you try being skeptical of your lying, murdering government instead? I get my shits and giggles from being skeptical of everyone. I apply the same standard to you as I do to everyone else. The 15-year-old, like you, has virtually no knowledge of fairly basic materials science and structural engineering. I am simply correcting this. It's perfectly acceptable for you, the 15-year-old, and David Icke to not understand structural mechanics, since you are not structural engineers. You have, however, expressed an opinion which is based upon a faulty understanding of the science. Your ignorance is hampering your judgement, because you think you understand something that in reality is far more complicated than you believe. Again, I'm not saying that I believe any particular version of events. I didn't investigate the collapse. I'm simply informing you that the structural mechanics of the situation are complicated, and for you to insist that the buildings collapsing on thier own is ludicrous is indicative of a lack of understanding of how structural engineering works. Several of your comments illustrate your ignorance, which my three points above are intended to correct. What about the Insurance policies that covered Terrorism specifically? What about the black boxes that were never found on the planes? Why was there molten steel? For WEEKS, not a day or two. MOLTEN STEEL! Last Question, if its so easy for your brilliant mind to piece this together, then why are you on here talking to us laymen? Isn't there some pro douche bag site you could be masturbating and spreading lies with your friends? I am not on any side, unless you consider "truth" to be a side. I am not endorsing any official or unofficial interpretation of events. There is a significant amount of evidence that Eric has presented which is extraordinarily suspicious and lends significant credence to his position. I have not argued with any of this other evidence which I think is pretty compelling. Some of the "evidence" he has presented here, however, betrays his lack of understanding of the situation. To an observer such as myself, who understands the situation better than he does (not because I think I am smarter, but simply because it happens to be my field of expertise), this negatively affects his argument as a whole. Given that I know he does not understand the situation, I then have two options: either I say something, or I do not. If I do not say anything, what happens is that anyone who doesn't understand the situation on a structural engineering level reads this article and thinks "whoa, he's totally right!" for the wrong reasons, and anyone who does understand the situation reads it and thinks "this dude is an idiot," and likely discounts his entire argument. If I do say something, then a number of beneficial outcomes are possible. Perhaps Eric will revise his argument to correct its previous inaccuracies, making it stronger as a whole (this happens to have been my hope when I initially commented). Perhaps someone will read his article, and then read my comment and realize the article's flaws, thus better informing thier thinking. At least by saying something, there is the potential for more informed thinking, however remote. I am not, in any way, attempting to disprove the article. On Rodriguez, why do you think Alex Jones thinks of him as a "true hero"? Because he is an hoax too. Ridiculous story.